Posted on January 2, 2018 by Victoria Patti. This is the Blacksmith Buzz Bulletin. Where you get the low-down about upcoming classes and events that are happening in the following month, though this month I’ll be telling you about classes and events happening in January and Feb 2018. I’ve got a lot of schools and events lined up for the rest of the year coming at you every month. This year is the bi-annual ABANA conference which will be held in Richmond Virginia June 27th – 30th, registration is open on the abana.org website. Also, this year’s CBA Spring conference is held in Placerville, CA, just outside of Sacramento, the dates are April 12th – 14th and registration just opened on their website, www.calsmith.org, this year it’s $180 for the 3-day event. As of Jan 1 Haystack Mountain School of Crafts, application process opens for the two blacksmith summer sessions they will be holding. 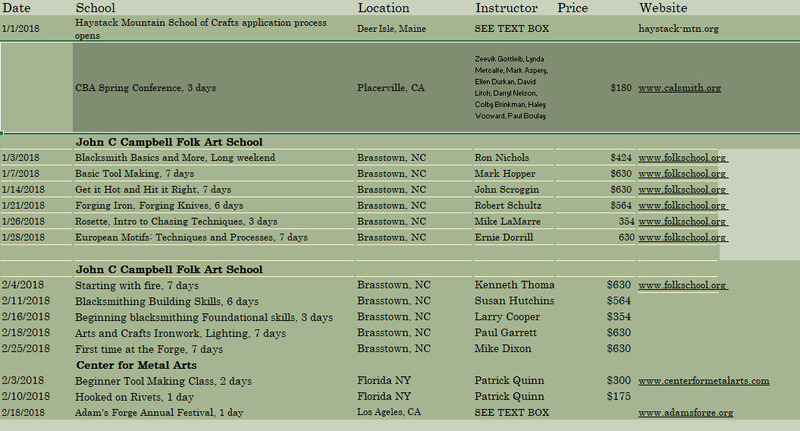 The two classes are: on June 10th Patrick Quinn is teaching “Thinking Big, Working Small”, it’s a 2-week session. Workshop students will explore sculptural forms through forged, riveted, and mechanically fastened parts. Working with thin gauge plate and other small-scale industrial materials, focus and emphasis will be placed on creating small-scale sculptural pieces using joinery techniques, paired with inspiration from large-scale public works. June 24-July 6, 2018, Marc Maiorana, Heirloom Iron This workshop will teach students to create ironwares for the home that will stand the test of time. Adam’s Forge is a non-profit org founded in 2002. This organization offers a regular schedule of blacksmith and metalworking classes. They are starting a fundraising campaign to build a new forge home at the Heritage Square Museum in Los Angeles. This is a call for art from all the blacksmiths out there to help raise funds for the relocation and the new smithy building. They are hosting a one-day annual festival for the public on Sunday, February 18th. You can donate hand-forged items that they can sell at the festival, be sure to add your touch mark and send it in before the end of January. Mail your metal donations to Adam’s Forge at 2640 North San Fernando Rd, Los Angeles, CA 90065. They are also accepting cash donations and another donor has stepped up to match dollar for dollar donations, up to $5000! All of the details are on the Adam’s Forge website which is http://www.adamsforge.org.